This little house pre-dates the arrival of the Midland Railway by a considerable margin, and no doubt its route, when first marked out on a map, was intended to avoid it. That in itself suggests there was more to this house than the name Cottage now suggests. There surely must be a more consequential history than research presently reveals. The end elevation of Dell Cottage is all that most of us are privileged to notice. The first map above is part of the survey by Dury and Andrews, 1766. We'll have to look closely for Dell Cottage, however. 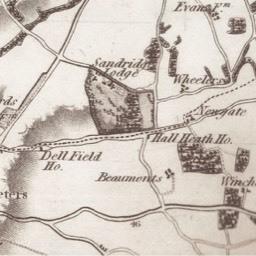 Sandpit Lane is shown, approximately west-to-east, from the houses at Snatchups (just above "St Peters") out to Hall Heath and then Newgate Farm. The map is shaded where the ridge exists. 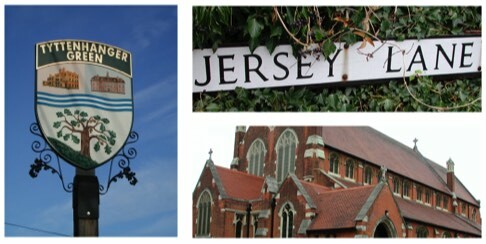 Just to the east of the name "St Peters" is a tiny black rectangle on the south side of the Lane. This is Dell Cottage (or Dellfield), but it is not named. Interestingly, there is an additional building shown on the bluff at Hall Heath (probably near where Monks Horton Close is today, on the south side of Sandpit Lane). Hall Heath is a potentially ancient settlement, but is largely devoid of historic dwellings today, other than the two sets of former farm workers' cottages. The end elevation is all that most of us may notice as we pass over the Sandpit Lane railway bridge. Even from this limited perspective we can judge that, in style, it appears to be 18th century, and perhaps earlier. 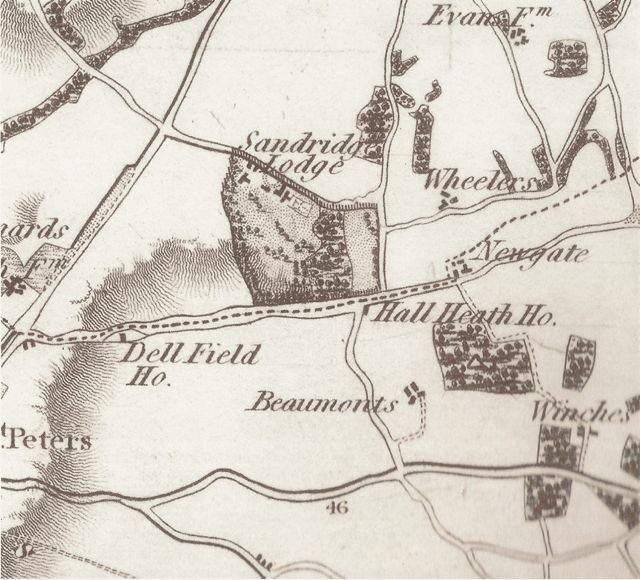 Named Dell Field House on the Bryant 1822 map, just to the west of it is the shading which represents the edge of the ridge or steeper slope. This is seen in Sandpit Lane on the town side of Lemsford Road, and in Avenue and Hillside roads. This gradient once continued past the house but the Lane was re-levelled on the town side of the bridge when the railway was constructed. It is this which resulted in the entries to Battlefield and Lemsford roads being later laid out at steeper gradients. 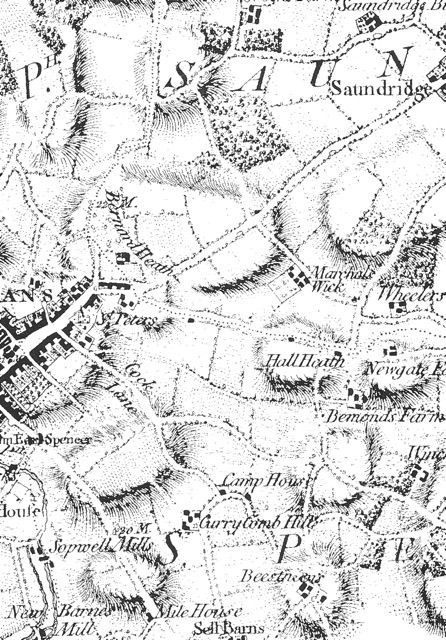 The St Peter Parish Map produced by Rumball in 1826, is aligned with east to the top of the map. The road to the left of the fields is Sandpit Lane. Beyond the top in this extract are the former chalk workings called The Dell (not to be confused with Dell Cottage), which would later accommodate a large house for Mr Grimwood (c1903) and the current The Dell apartments. Dell Field House (or Dell Cottage) was standing empty at the time of the 1911 census and was therefore not enumerated. 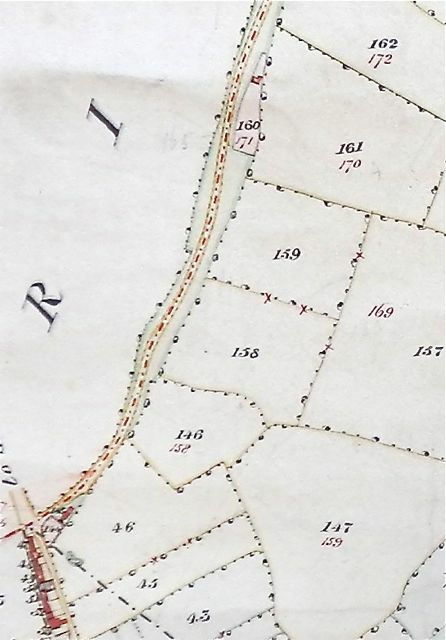 The road near the bottom of this map is St Peter's Street north.Plot 160, to the left of field 161, is Dell Cottage. The green of some of the Sandpit Lane Wastes can also be picked out. 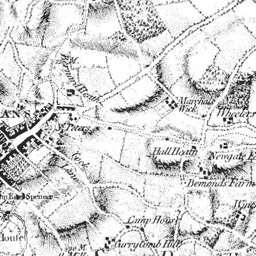 The 1840 Tithe Map, not represented here, shows the position of the cottage in Sandpit Lane. At that time the property was in the ownership of the trustees of Rosy Mary Heath and John Coales, deceased. 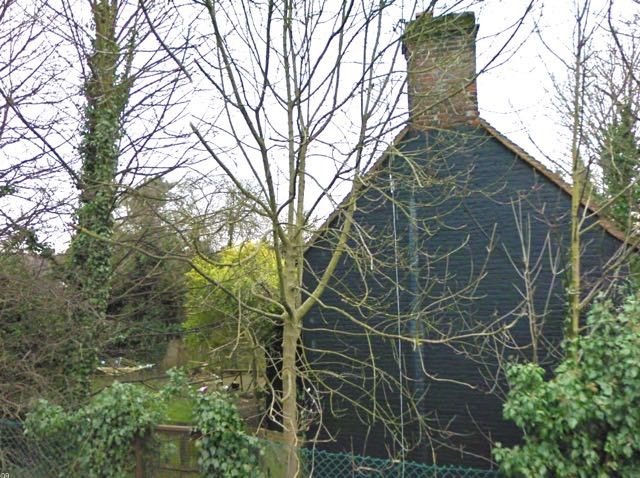 It was occupied by William Slough, an agricultural labourer; he continued to live there through the census years of 1841 to 1871, after which it was occupied by a railway plate worker called William Smith. The house had a lucky escape in the 1860s when the Midland Railway submitted its revised route plan under the Railways Act. 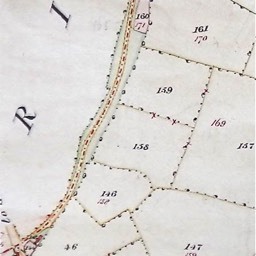 The house is named in the submission as it lay within the parameters of the route variation; a band of land beyond the centre line of the proposed route which had to be declared. The wide aerial view, courtesy GOOGLE, shows the increased depth of Wastes where Dell Cottage was originally built. 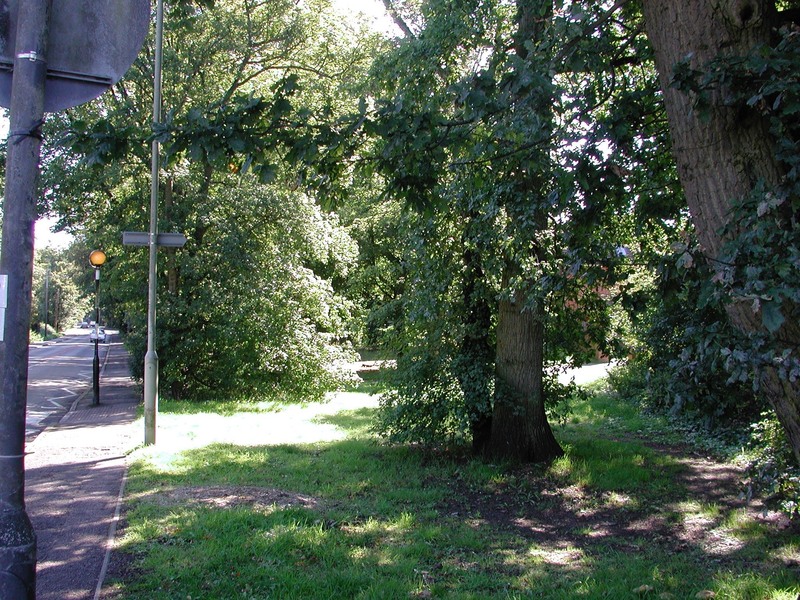 The western end of the plot, on the right of the photo, was transferred for WW2 use and subsequently as a Scouts headquarters. Lemsford Road is shown as it meets Sandpit Lane. The photo below is a wooded section of the Wastes east of Clarence Road. 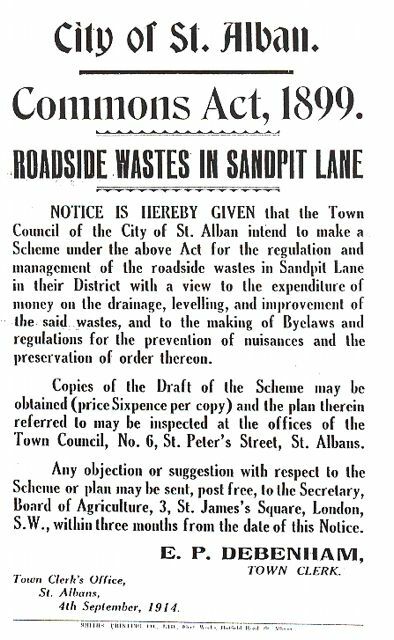 The Wastes which occur irregularly along Sandpit Lane are protected under the Commons Act, and their history is probably uncharted. Consents are obtained where a property owner built on land behind them and needs to cross the waste to gain access. The St Peter's Parish map shows the Wastes along Sandpit Lane coloured in green. Dell Cottage and its plot appear to have been created and subsequently fenced from a wider section of the Wastes. The length of Sandpit Lane between Lemsford Road and Stone Cross has been protected from development and it is the backs of properties in Avenue Road which are visible from Sandpit Lane.